Unique wine cellars. We love them! 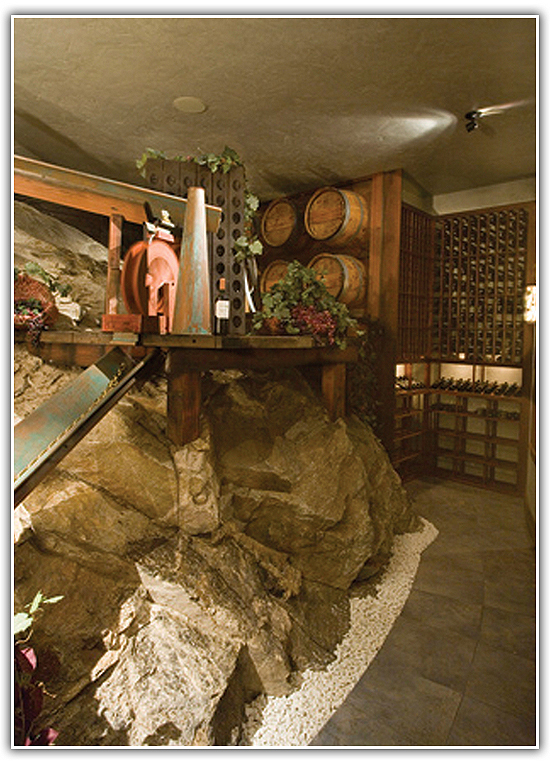 Today we’re sharing another fantastic job done by our Idaho wine cellar dealer. This project was located in Post Falls, ID and required them to convert a large rock the owners were tired of blasting for the foundation work. It was determined that a “terrarium-type” diorama scene would be in keeping with some of the other fantasy projects in the rest of the home, so complete creative license was given to make what would be seen through the viewing windows interesting and fun. The size of the place allowed room for an interesting design and layout concept. The large rocks required a bit of a challenge, but our dealer made it work. Just look at how this wine cellar turned into a fantasy winery! Wine barrels mounted on the wall completes the illusion of this fantasy winery in Post Falls River Residence. The decor is as interesting as the wine collection, don’t you think? We love how the wine barrels were used, and the grapevines provide an interesting burst of color to this wood dominated room. Perhaps the most interesting feature of this wine cellar is the re-circulating water feature that starts at the wine press, to the copper flume and continues through a mini water wheel and into the barrel. Genius, right? Notice the strategic lighting that adds polish to what could have been an otherwise dark cellar. The wood wine racks in this room can accommodate hundreds of bottles, but we must say that the decor in this wine room begs more attention. It’s always about the details when it comes to wine cellars, and here notice the left of the functional racking where the ‘cooperage’ is, along with a workbench and antique tools. A platform built on top of the rock maximizes space and showcases the tools. 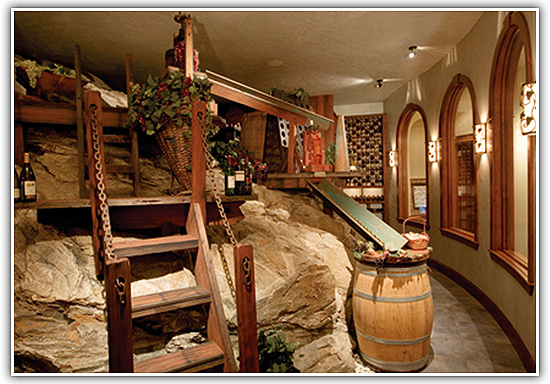 Chutes, ladders & platforms help create a winery cave theme. The far corner combines creative aesthetics with more functional storage. This is one sophisticated “cave”, if you ask us. This, dear friends, is an example of how you can turn a problem into a solution. The huge rocks that posed a difficult challenge became part of the design, and lends an organic feel to the space! 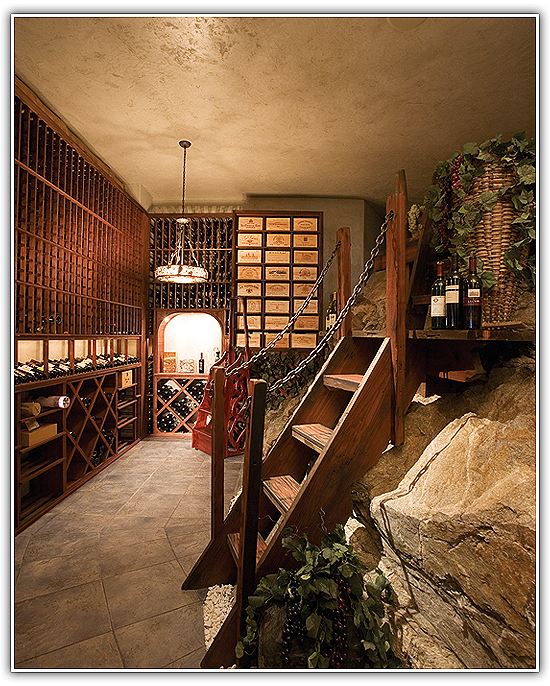 Aside from the wine racks and the stone boulder, another feature of this wine room are the custom made rolling ‘grapevine’ stool and the fixed stairway to the ‘fantasy’ platforms. Good lighting through the project was an important design key, and it did do a great job of highlighting the eye catching areas of the room. Needless to say, this unique wine cellar is a feast for the eyes! 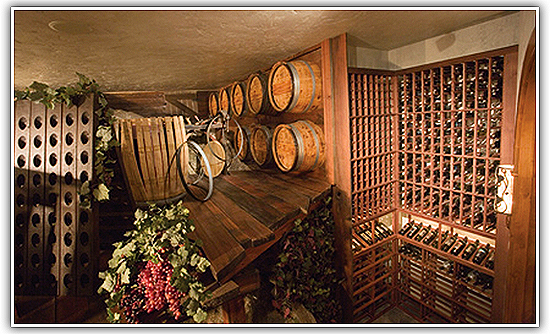 There are so many interesting details in every corner yet they all come together to create a truly spectacular and unique wine cellar. If you’re interested in a customized wine cellar, contact us today!